The special summer pick of 2009, Star Trek is big, brassy and grand. It is old fashioned space adventure in a reassembled bottle: selling itself as the Star Trek film that even non-Trekkies can love. We - the ultimate non-Trekkies - can attest that, yes, we loved it. We can't seem to find any 2009 Star Trek images! So William Shatner in a pile of fuzzy things will have to suffice. Image from scificool. Thankfully, the new Star Trek presupposes no special background info to get into the fun. And fun it is, full of black holes, stoics who are softies on the inside (OMG, Spock hotness alert), a Singularity shout-out (! ), a Stanislaw Lem shout-out (!! ), and much more of our favorite geek things. The director, J.J. Abrams (of Lost fame) has a special eye for capturing the particular majesty of old school, classical sci-fi: there are some wide-scope space panoramas of breathtaking beauty, and the internal ship is suffused with light from infinite sources. It looks sleek and gorgeous. Backed by a score that is just as traditional and large-scale as its glorious imagery, it makes for some pretty hard-to-resist viewing. Beam me up, hotties. Image from screen.ology. The movie follows an alternative history (apparently!) of the first Star Trek crew: Captain James T. Kirk (Chris Pine, stud factor=meh) the Stereotypical American Hero, Spock (Zachary Quinto, stud factor=hotness) the sensitive logician, Ahora (Zoe Saldana) the only woman on the entire ship (!? ), Chekov (Anton Yelchin) the comic relief, Scotty (Simon Pegg) the other comic relief (he can't take much more of this, Cap'n! 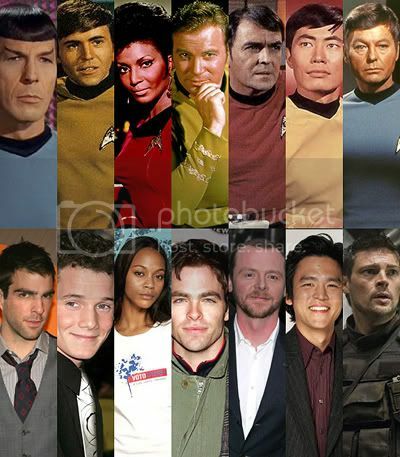 ), McCoy (Karl Urban, stud factor=maximized) the badass doctor, Sulu (John Cho) the cute. Oh yeah... and Spock (Leonard Nimoy). When not busy battling black holes, time loops and angry Romulans (led by a nearly unrecognizable Eric Bana), the crew have the usual personality clashes. We also get a very emo Spock (yay!). Then we get two Spocks (best film ever?!). Anyway, as is usual in these highly mainstream Hollywood hero myths (Dark Knight... Lord of the Rings... Star Wars...), we at the PPCC find the Stereotypical Hero insufferably boring (imagine no Batman! no Frodo! no Luke! sigh, wonderful). With his blue-eyed, tough guy cowboying around, Captain Kirk is our unfortunate companion for much of the film. And alas, Chris Pine has none of William Shatner's demented, self-referential genius. The supporting cast, however, is colorful and lovable - indeed, they make the film. In the land of Geekdom, Star Wars fans and Trekkies hold an ancient rivalry. A rivalry which we at the PPCC, in honor of our love, were more than happy to uphold. But the wall has come down. Bridges are being built. We are abandoning our prejudices and welcoming the Trek people with open arms. While we have long secretly admired the Trekkies for their pioneering work in fandom (dammit, man, they invented slash! ), we can now openly say: Star Trek is a cultural force to be reckoned with, and we are now more than happy to reckon. In fact, we'd be quite happy to reckon with it a little more... perhaps via a sequel? 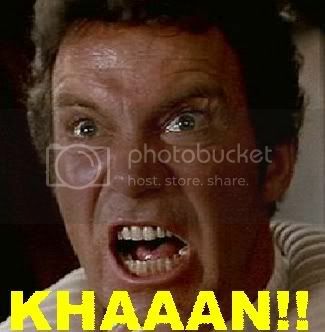 And, as this article argues that maybe an Indian actor should be playing the Indian character of "KHAAAAAAAAAAAN!" in any Star Trek: Wrath of Khan remakes, may we suggest... Anil Kapoor? Or have you your own suggestions, PPCC readership? Make yourselves known! Nana Patekar as Khan would be pretty cool. Om Puri as well. 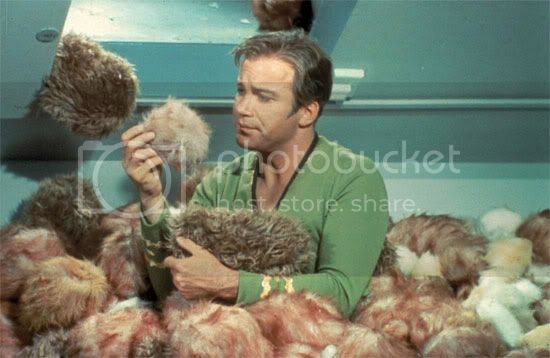 Tribbles...the fuzzy things with William Shatner are Tribbles. I can never watch the subsequent series or the films because the cheesy goodness of the original is too sublime to overwrite or improve upon. The episode is called The Trouble with Tribbles. It's a classic. I'm not a Trekkie, but the original series is brilliant. Ramneek - I thought of Om Puri as well! My latest picks are also Kay Kay Menon and Amitabh Bachchan (!!). Memsaab - OMG I'm loving it. Clearly Star Trek is masala in space. And everything's better in space! Ramneek2 - Is there some sort of list of Best Star Trek Episodes? I keep hearing about great ones, and I want to watch more - but I don't know where to begin! I finally saw Star Trek this afternoon, and I loved it! I want to see it again! I just have one tribble, er, quibble with your review: It's Uhura, not Ahora. And I always think it's weird that there's a Star Wars vs. Star Trek rivalry. Why can't people love both!? Kay Kay Menon would be unreal. I wonder if Star Trek was ever remade in Hindi. We have Superman with Dharmendra playing Jor-El and Puneet Issar playing the titular character. I’m not sure of a best-of list, but I’m really fond of episodes like The City on the Edge of Forever, A Piece of the Action and Patterns of Force. In my opinion, these 3 episodes are the ones to watch if you want to get into Star Trek. Also, Wrath of Khan was actually a sequel to the episode Space Seed. Just some trivia. SpyGirl - Woops, thanks for the correction! I was actually thinking about the Star Trek/Star Wars distinctions today. I'm much, much more familiar with the latter, but what little I've learned of the former has given me the impression that it's much more old school, classical, "good ol' boy" sci-fi. That is, even though it was socio-politically progressive, it still had a bit of a Wild West vibe. Star Wars, instead, coming from the 70s, was much more New Wave sci-fi - a pessimistic outlook, dirty junky aesthetics and hippie-esque mysticism. And space wasn't Wild West-ish, it was more troubled - almost postcolonial! You can follow the sci-fi progression into Blade Runner, which ran straight into 1980s cyberpunk. (I don't know how accurate this is, but it's interesting to trace the visual media sci-fi trends with the literary sci-fi ones!) So I think the Star Trek/Star Wars rivalry may come down to artistic sensibilities and style preferences: whether you like your future bright or dark, happy or tormented, clean or scruffy. Maybe I'm over-simplifying? Ramneek - OMG you are an awesome contributor with your Trekkie wisdom. I have to check out those eps now! Ramneek2 - OMG YES!! JACKPOT! And that kills 2 birds with 1 stone by reviving Roshan Seth's moribund career too! :-) It is masala in space! Totally!!! I agree with Memsaab (although my personal fav is the one in which Spock has to go back to Vulcan for his mate and goes absolutely nuts) - it's only three or four seasons. It ran a ridiculously short time. And it's like those 70s Bollywood murder mysteries - they used to air right after Mr. Rogers when I was a kid and I thought they were fab. Also Zachary Quinto is now on my Freebie Five. Sigh. If he and KayKay Menon appeared together in a movie, my head would explode. Yes, I AM a Star Wars fan, I unsuccessfully tried to see some episodes of Star Trek in the past (boooring!) and that I (thought I) couldn't stand this movie. But I liked it. A LOT. Yes, sci-fi masala, you're right! AND the i-should-not-feel-anything-but-i-feel-something-so-i-angst Spock surely helped me a lot in achieving this goal. I can't help to deeply fall in love with these characters (if made well). I was a total Trekker in high school (and before) but couldn't lay claim to that level of fandom now. Still, I can highly recommend the award-winning episode "The City on the Edge of Forever" as the best of the original series. And I thought (think) Chris Whats-his-face is hotness squared. For a gora anyway. It was cool that they took him from the 60's icon of overachieving JFK-type and transferred it to the 2000's ideal of rebel outsider who needs a cause. memsaab - Dammit, Jim, I will! Masala + space = heaven. Amrita - Kay Kay Menon just needs to be in more movies, period. In space. Kalla - Word up, we're in the same boat. I still can't bring myself to take the show seriously, but the movie - yes, plz. ajnabi - There was a really interesting article on how it's so awful, terrible, blah blah that Star Trek is a post-feminist movie set in pre-feminist times, and (wail) why do they need to ridicule Kirk's flirtatiousness, etc etc etc. It was all very confusing. But interesting. My heart still belongs to McCoy. "SHINGLES!" "Bleeding eyes!" Loved him.